Being one of the most copied designs (and a timeless classic), we are always hesitant to purchase an unsigned Barcelona lounge chair and we suggest you be hesitant as well, so of course we were delighted to find this fantastic pair which are both double-signed with Knoll International tags showing the earlier 320 Park Ave address and Knoll Production (KP) stamp to both frames. With this set, you'll feel pride in that you have the "real thing", and an early rare double signed matching set at that... while your friends boast either a knock-off, reproduction or brand-new production-line versions which do not have the collectability value as the earlier originals such as this pair. Often, sellers will state their Barcelona chairs are by Knoll and often even state they are earlier productions (1960s and 1970s)... If they do not have Knoll Associates or Knoll International labels you should be very cautious of their claim. If they have a Knoll repeat pattern under the cushion or Knoll Studio stamps on the frame it means they are by Knoll but are the recent production versions and not the early originals. Considered to be the epitome of modern design, Ludwig Mies van der Rohe and Lilly Reich originally designed the Barcelona chair in 1929 to serve as seating for the king and queen of Spain in the German Pavilion. This was Germany's entry for the International Exhibition, hosted by Barcelona, Catalonia, Spain. 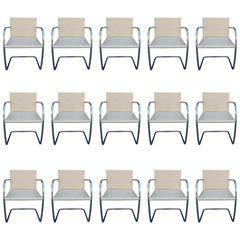 These club chairs were produced by Knoll International and are still to this day using the same specifications. These frames were made with polished chrome hand-ground and hand-buffed to a mirror finish with brown leather upholstery straps attached with aluminum rivets. The upholstery is fabricated from a single cowhide with each individual panel being cut, hand-welted and hand tufted with leather buttons. Whether you're a designer seeking a quintessential piece or a collector adding to your modern design collection, these iconic chairs Stand the test of time. Ideal for a living room, study, den or home cinema. They would also work well in a hospitality lobby or corporate location, such as; a private members club, conference room or executive office. Measurements: 30.25" H x 29.5" W x 30" D Seat height: 17" Frames are in excellent vintage condition with shiny and clean finish. No damage or issues to frame, one of the cleaner and nicer frames we've seen. KP stamp is found on both frames which is a huge plus to this set as most Barcelona frames are found without this important stamp which stands for Knoll Production and was only used in the earlier original productions of this design. Leather straps are in very good condition with no defects or issues. Sturdy and structurally sound. Leather cushions have had previous distressing but have been repaired and restored. Leather was re-dyed to Revive the color. Some areas with heavier visible repairs. Cushions are in overall good condition. Frames are in excellent original condition with no issues, very clean and bright finish. Straps are in very good condition with no issues. Leather cushions had prior distressing but have been repaired and re-dyed. See description for more details. Exceptional early split frame pair of Barcelona chairs by Mies Van der Rohe for Knoll in the most desirable leather.